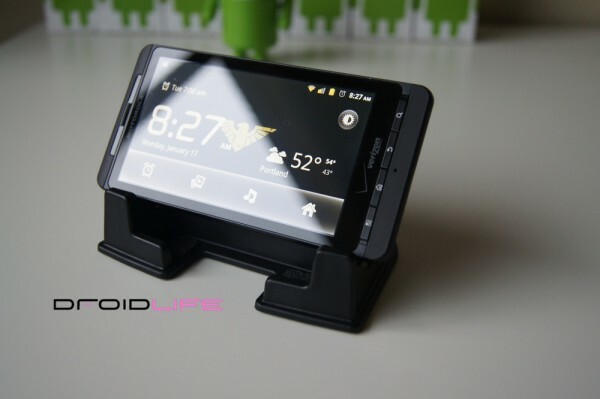 As our long time readers know, we’re big fans of the ezeStand, which was one of the first and most affordable DROID stands on the planet. The original came out back around April 2010, and since then we’ve given away at least 3 of them through a variety of contests. The guys behind this classic have been kind to the Droid Life community, so it brings us great pleasure to help announce their newest product, the ezeStand XL. This new version was made specifically for all those big devices/”hummers” out there, like our friend the DROID X and the HTC EVO. The base has been widened and will fit any phone in portrait measuring in at 2.85″ which is pretty impressive. In fact, with my DX docked, I’ve easily got another .5″ of breathing room, so I would have no issue even if I slapped a case on it. The XL also works as well as the original in landscape, but again, has been widened to accommodate the big boys in the Android world. It definitely includes a magnet, so if your phone rolls with a built-in alarm or docking app then you shouldn’t miss a beat in the mornings. They even tossed in a little clip for your USB cable to lock into on the back; a nice touch. It’s built from the same sturdy plastic that you’ll remember from the original, has the same rubber grippies to stop any slippage and overall is a great addition to their line of phone docks. At an always affordable price of $12.99, I’d recommend this to anyone looking for a new dock.